Start off your visit on the 24th (Tue): take in the spiritual surroundings of Tampere Cathedral, enjoy the sand and surf at Rauhaniemi Beach, and then stroll through Riihiniemen Uimaranta. Get ready for a full day of sightseeing on the next day: look for all kinds of wild species at Hatanpaa Arboretum, then see the interesting displays at Emil Aaltosen Museo, then see the interesting displays at Vapriikin Museokeskus, and finally soothe aching muscles at some of the top local wellness centers. For reviews, other places to visit, photos, and other tourist information, read our Tampere online trip itinerary builder . Bristol, UK to Tampere is an approximately 9-hour combination of flight and train. You can also do a combination of train and flight; or do a combination of train and flight. You'll lose 2 hours traveling from Bristol to Tampere due to the time zone difference. In September, daytime highs in Tampere are 17°C, while nighttime lows are 7°C. Wrap up your sightseeing on the 25th (Wed) early enough to take a train to Turku. Start off your visit on the 26th (Thu): take a stroll through Naantali Old Town, explore the world behind art at Ett Hem Museum, and then look for all kinds of wild species at Vepsa Island. For traveler tips, other places to visit, where to stay, and tourist information, use the Turku trip itinerary app . You can take a train from Tampere to Turku in 2 hours. Other options are to drive; or do a combination of train and flight. In September, daily temperatures in Turku can reach 18°C, while at night they dip to 7°C. Finish up your sightseeing early on the 26th (Thu) so you can go by car to Vaasa. Kick off your visit on the 27th (Fri): step off the mainland to explore Kvarken Archipelago World Heritage Site. For maps, where to stay, reviews, and tourist information, you can read our Vaasa trip website . Drive from Turku to Vaasa in 4 hours. Alternatively, you can fly; or take a train. In September, plan for daily highs up to 17°C, and evening lows to 7°C. Wrap up your sightseeing on the 27th (Fri) to allow time to travel to Koli National Park. Step out of the city life by going to Paha-Koli Hill and Akka-Koli Hill. Spend the 29th (Sun) exploring nature at Patvinsuon Kansallispuisto. To see reviews, ratings, more things to do, and other tourist information, you can read our Koli National Park day trip website . 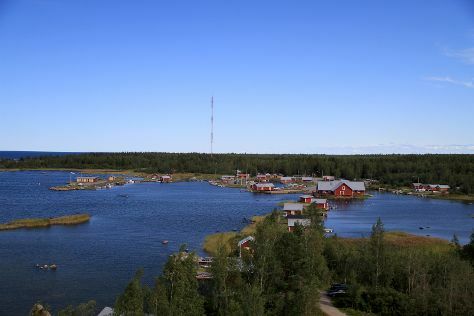 Traveling by car from Vaasa to Koli National Park takes 6.5 hours. Alternatively, you can fly. Expect a daytime high around 15°C in September, and nighttime lows around 7°C. Finish your sightseeing early on the 30th (Mon) so you can travel to Kotka. Kotka is a city and municipality of Finland.Kotka is located on the coast of the Gulf of Finland at the mouth of Kymi River and it is part of the Kymenlaakso region in southern Finland. Start off your visit on the 1st (Tue): hike along Santalahti Nature Trail, wander the streets of Hamina Old Town, then look for all kinds of wild species at Riverside Park, and finally wander the streets of Linden Esplanade. To find where to stay, other places to visit, more things to do, and more tourist information, use the Kotka route maker tool . Drive from Koli National Park to Kotka in 5 hours. Alternatively, you can fly. In September, plan for daily highs up to 17°C, and evening lows to 9°C. Wrap up your sightseeing on the 1st (Tue) to allow time to drive to Helsinki. Sea Fortress Suomenlinna and Helsinki Cathedral are good opportunities to explore the local culture. When in Helsinki, make a side trip to see Nuuksio National Park in Espoo, approximately 46 minutes away. The adventure continues: contemplate in the serene atmosphere at Rock Church, wander the streets of Katajanokka, appreciate the extensive heritage of The Esplanadi Park, and soothe aching muscles at some of the top local wellness centers. For more things to do, photos, traveler tips, and more tourist information, go to the Helsinki tour itinerary site . Traveling by car from Kotka to Helsinki takes 1.5 hours. Alternatively, you can take a bus. In October, daily temperatures in Helsinki can reach 10°C, while at night they dip to 1°C. Wrap up your sightseeing on the 4th (Fri) to allow time to travel back home.